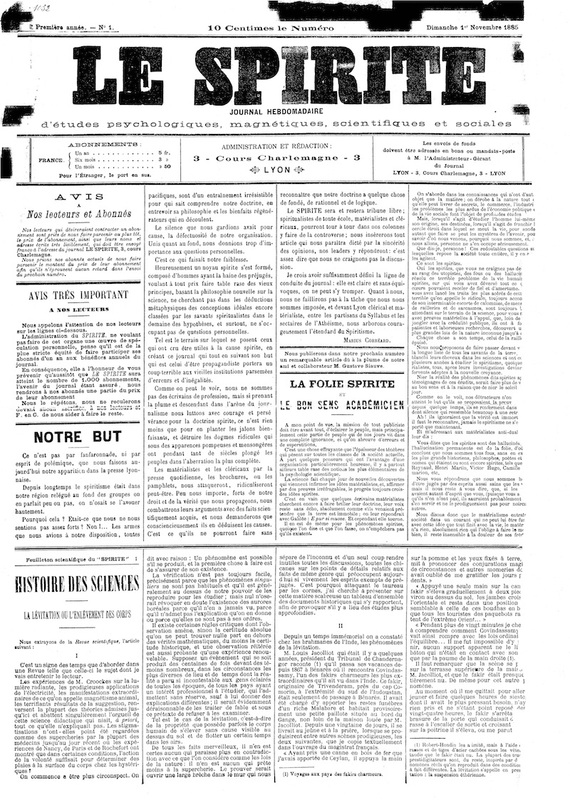 Journal hebdomadaire d'etudes psychologiques, magnetiques, scientifiques et sociales. 1/1, November 1885. 4 pp., 5 francs a year. The journal announced its intention of being a forum for all branches of spiritualism and magnetism but also carried articles on the history of occultism and on Martinism in Lyon at the end of the preceding century. Contribution (on levitation) by A. de Rochas. In its first issue, the journal promised that, as soon as it had attracted 1,000 subscribers and assured its survival, it would return an unspecified part of the subscription price to its subscribers. This was a safe commitment since apparently only two issues were published. BNF.